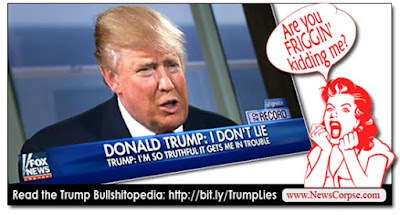 If you think President Chump has trouble sleeping because he constantly lies about things...you better think again. Rump is pushing 71-years old, and there's no way to teach this old dog new tricks. Just follow the dots since his daddy gave him a "small stake" of $1 million dollars to get started in business. Hump has been caught lying so many times over the years in real estate scams (3500 lawsuits) that there is a mountain of evidence to be found in newspaper and magazine articles over the past five decades. One of his most famous lies - Obama wasn't born in the US - opened the door to his presidency by getting Obama-haters, and alt-right groups to support him. In an excellent four-piece series the LA Times looks at the four most serious things to worry about when talking about our Liar-In-Chief. Donald Trump's utter lack of regard for truth. "Whether it is the easily disprovable boasts about the size of his inauguration crowd or his unsubstantiated assertion that Barack Obama bugged Trump Tower, the new president regularly muddies the waters of fact and fiction. It’s difficult to know whether he actually can’t distinguish the real from the unreal — or whether he intentionally conflates the two to befuddle voters, deflect criticism and undermine the very idea of objective truth. Whatever the explanation, he is encouraging Americans to reject facts, to disrespect science, documents, nonpartisanship and the mainstream media — and instead to simply take positions on the basis of ideology and preconceived notions. This is a recipe for a divided country in which differences grow deeper and rational compromise becomes impossible." It's pretty bad when you have to fact-check everything the president of the United States says. But, it's our reality as long as Stump sits in the Oval Office.